As great interest has been evidenced throughout the district in the Bown cases, we have given a full report of the Assize Court proceedings which closed on Saturday. Owing to the pressure on our space, leading and other articles are unavoidably held over. The investigation of the charges against the Bown family and a young man named Fenton was proceeded with on Saturday morning, last before Mr. Hutchinson, P.M. and Mr. Dagenhardt, T.P. The cases lasted the whole day, and the most intense public interest was manifested in the proceedings, a very large number of farmers and others denselypacking the court the whole time. The first and principal charge was that of stealing wheat from the Messrs. Delahunty Bros. of Jung Jung. After a great deal of evidence (including that of Delahunty Bros. who swore positively to the grain and also the bags) was taken, the four prisoners, mother, son, daughter, and the son in-law Fenton, were fully committed to take their trial at Horsham on the 15th March next. Three other charges of larceny were then proceeded with, and a primafacie case having been established in each instance, the prisoners were committed. I understand that there are other cases to be proceeded with against the prisoners. Mr. I. Walsh, Crown Prosecutor. The Crown Prosecutor, having opened the case called Rodie Delahunty, who deposed he was a farmer, residing at Jung Jung with his brother James. On the 2nd January this year had some wheat; it was in the paddock in bags; they ‘were piled in the paddock; there were 25 bags in one pile and some others piled further in the paddock. The 25 bags were within about six yards of the log fence, a reserve was on the other side. There was no roadway or beaten track to the point opposite where the 25 bags were. Saw the pile of 25 sacks last at 8 o’clock in the evening on the 2nd January. It was Saturday evening. On the Sunday morning went up to the paddock where the wheat was it was about half a mile from the house. The size of the farm was about 2,000 acres between them; 640 acres in this portion. more there and some of them burst; they were on the ground. The waggon seemed to have been bogged there. The reserve was not fenced. Went on and followed the track of the waggon in the direction of the Jung Jung swamp, the waggon had been close to the water and took a circle back again on to the beaten track. Had also found a whip where the first 8 bags were found: gave it to Senior-constable Mullaney. Witness’ brother James was with him. Went in the direction of Murtoa, following the track, when they got to Murtoa followed the track from the Murtoa water reserve. The weather was fine at that time, something like at present. Was able to track the waggon the whole of the distance. Followed it as far as Mr. Miller’s in the direction of the Sawpit Swamp, then informed the police. Mullaney came with witness and went to where they had left off at Miller’s where they had knocked off the track, and then followed the track on still round the racecourse, and went back again and followed it back to the reserve, about 7 miles. On going back did not follow the same track as coming from their own place. Returned through the one chain-road along a second track. At the end of the lane saw a leaning tree, and saw where the bark had been torn off recently and red paint inside the bark on the tree. The piece produced with the mark on it was it. Followed on that track’ right up to where he found the first lot of wheat up close to the fence. Then again followed the same track as in the morning. There was no difference in the tracks, except that one was deeper than the other. There was a difference of three inches. The greater depth was on the track going away. The policeman went over the first track and followed it to the corner of the racecourse, and on getting at McLeod’s, went on then to Bown’s place. The track to the farm from prisoner’s place was shorter than the track from it. The track after leaving the corner of the racecourse they passed at McLeod’s house that was about a mile from the prisoner’s place. Went into the prisoner’s place and saw the elder prisoner, Catherine Bown, the mother of the other two. Constable Mullaney then said he had a search warrant to look for wheat stolen from Mr. Delahunty. He asked her where was her son and she said she did not know. They then followed the tracks down to where they found two piles of wheat and found no resemblance to their wheat. Then went over to the smaller stack and opened some of them, and the ones they opened were not like their wheat. Then went down to the winnowing machine and there found nine bags exactly corresponding with theirs. It was unbleached, and was clean, a first crop off virgin land. Also these nine bags were sown by the hem of the bags turned in and top sown, the same as millers sow their bags. That was an unusual way for wheat bags to be stitched. They were not stitched in that way when lost. They were stitched in the usual way.I The hem on witness’ was visible, and the hem on these nine that were found was invisible. The wheat was similar to witness’, but the bags were stitched different. On cutting some of these nine bags there were pieces of twine as if they had been sown, cut, and sown up afresh. This was about half-past seven or 8 o’clock in the evening. Up to that time had not seen the prisoners, Robert or Annie Bown. Remained there until 10 o’clock and then Robert and Annie came with two horses and a new waggon painted red and blue. Annie Bown went to witness’ brother James and took him by the shoulder and told him to go off her land, and Constable Mullaney told her he was going to arrest her for stealing the wheat. She shook witness’ brother and the constable took her away. Had known the prisoners for about 11 years. There was a man named Bowen or Fenton living there for about 12 months. James Delahunty, brother of the last witnees, corroborated the evidence he had given. Identified the pieces of wood cut off the log fence with paint upon them, supposed to have been left by the paint on the waggon outside the court; also a small chip picked up close to the fence where the mark of the waggon was. Found the second 8 bags near a crab hole. Senior-constable Thomas Mullaney, stationed at Murtoa, deposed that on the 3rd of January last the two previous witnesses called at the station between 11 and 12 o’clock. Went with them to near the Lake fence and continued the tracks pointed out by them to the corner of the racecourse ; proceeded towards Keeple’s lane, found tracks of the horses and waggon going up that lane; continued these tracks for 2 miles where the lane ends, and further described the progress of the tracks of the waggon as traced. The paint on the piece of the tree produced corresponded with the mark on the paint on the bearing of the waggon. To Robt. Bown — The marks at the fence were footprints, had compared them and they appeared to be made by the boots produced worn by the man Tom. It was about 10 o’clock when you came home; did not see the other man then. There were other marks, but none so plain as those covered up; would not swear that there were marks caused by other boots than those produced. Kenneth McLeod, a farmer residing at Sawpit Swamp, near Murtoa, deposed that he knew the prisoners, who resided about a mile from him ; had known them 2 years, farming. Witness had been there 11 years and they only; 2 and 1/2 years.’ Had seen them constantly. They had a new waggon painted blue with a little red. Had seen Robert Bown, Annie Bown, and the other man that was with them (meaning the prisoner who pleaded guilty). On 2nd January saw that waggon and two horses pass his house at a quarter to 10 in the evening, going in the direction of Murtoa from the direction of their place:’ Knew their horses by sight, a grey and a bay; those two horses were in the waggon. Could. not discern who was driving; ‘there were two in the waggon and could not say there were not three’. At about a quarter to four in the morning they passed in the opposite direction, going towards their own place. Saw one person driving the waggon. Was not dressed at the time, but got out of bed because he heard a noise and looked out and saw the waggon. In the evening it was not more than fifteen yards from witness’ fence and in the morning about two chains or two chains and a half. At 10 o’clock on Sunday morning saw Robert Bown, Annie Bown and the third man going towards Murtoa with the same waggon and the same horses. To Robert Bown — Could not say how many were in the waggon on Saturday; could see two heads; only saw one when it was coming back. Could not say whether there were any more in the waggon. Saw the waggon come back on the Sunday night about half past eight or a little later. Saw three in it that night. Annie Bown was one of them. The waggon, outside the Court was the waggon referred to. To His Honor — Knew the father of the two younger prisoners who used to reside with them; he was found drowned in a water hole about 18 months ago. Jessie McLeod, sister of the last witness, deposed that she resided with him, and knew the prisoners who lived about a mile and a half from her brother’s place. They had a waggon and a dray, a new waggon painted red and blue. At 10 o’clock on the Saturday night heard a waggon going by towards Murton. Early in the morning was awoke by the noise of a waggon going by; lifted the window curtain and saw it was Bowns’ waggon going towards their place. Could see the color of the horses, a grey and a bay; could not say who was with the waggon. The waggon outside the court was the one referred to. George Evans, a miller residing at Murtoa, deposed that he had had a good deal of experience with wheat and described the various samples of wheat produced, testifying to the effect that the wheat in the 9 bags found at the prisoner’s (Bown’s) house was similar to those found on the reserve, all of which the prosecutors claimed as theirs, it being clean unbleached wheat; whilst the other samples produced, taken from the prisoners’ two stacks of their own wheat, was bleached and unclean. His honor said he would have to tell the jury there was no case against her. In answer to the usual question the prisoner Robert Bown said that Thomas Bowen, who had pleaded ” guilty,” on the 2nd January, borrowed the waggon to go to Murtoa, which he (prisoner) lent him, and on the Sunday morning found the waggon in the same place where it had been taken from. On that morning about 10 o’clock he and his sister and Bowen went to see some friends, and returning about ten o’clock at night, his younger sister met them about half-a-mile from their place and told them the police were there. Bowen hearing this ran away. He (prisoner) knew nothing about it, until told by the police they were charged with stealing wheat from Delahunty Brothers. His Honor then summed up, directing the jury to acquit the elder female prisoner, and to the effect that the evidence against the younger female prisoner was of a different character to that against her brother, but leaving it to the jury to say whether either or both were guilty. The jury retired and after an absence of about two hours acquitted the two female prisoners and found the prisoner (Robert Bown) guilty of receiving. Thomas Bowen, Robert Bown, Annie Bown, and Catherine Bown were charged with larceny of a saddle and bridle, the property of John Oppie and Charles Summers. on the 24th October; and on a second count with receiving the goods, knowing them to be stolen. John Oppie, a butcher, ‘deposed that in October last he was in Mr. Murphy’s employ as drover; knew Chas Summers, on 24th October last he was also in Mr. Murphy’s employ; that night witness and Summers were camped at Murtoa at the Show Yard left the camp that evening and went to’ a hotel about half-a-mile distant; left two saddles, two bridles, stockwhip, harness, coat, and Summer’s clothes, overcoat, and bridle; returned at about half-past 11 o’clock at night; did not miss anything that night; next morning missed one saddle, stockwhip, 2 bridles, and Summer’s overcoat and reported the matter to the police. Had seen them at the police station at Murtoa on the 4th January. Identified the articles produced as those that were lost. Was certain of the saddle and 2 bridles. Did not know the prisoners, but had seen them. Emile Habel, a saddler, carrying out business in Murtoa, deposed to selling the saddle produced to Mr. Murphy: Charles Summers corroborated the evidence of the first witness and identified the overcoat produced, which he had only had about a fortnight before it was lost; also identified the saddle and bridle. Had seen the prisoners in Murtoa with a new blue waggon once; saw Thomas Bowen and Annie Bown in the waggon on the Sunday. On the night of the 22nd of October saw a person pass Wilkes’ hotel half-a-mile from where witness camped. That man was the prisoner Thomas Bowen. He was going towards the show ground. Had seen him before but did not know where he lived. He was going towards Bown’s, to get there he would have to pass the Show grounds; they lived 4 or 5 miles from Murtoa. To Thos. Bowen — Saw you pass Wilke’s, that was within 3 or 4 chains of the main road. You were going in the direction of the Show grounds. Sen. Constable Thos. Mullaney deposed to searching the Bowns’ place and finding the articles produced there. 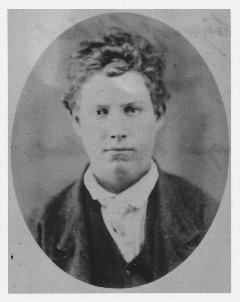 The prisoner Thomas Bowen addressed the jury, stating that on the 24th October he went into Murtoa to meet Annie Bown’s brother Robert (who pleaded guilty to his charge.) He had been away shearing. He got home before them and brought the saddle and the other articles with him, and said he had bought them. The saddle was never concealed, and he (prisoner) had ridden on it to Murtoa, thinking it had been bought. He had nothing to do with stealing it, and never knew it was stolen. His Honor summed up, stating that he did not see any evidence against either of the female prisoners, whilst the evidence against Bowen was slight. The jury retired and shortly after returned a verdict of “not guilty” in respect to the three prisoners. the last he would enter a nolle prosequi as regards the female prisoners. The case then proceeded against Joseph Bowen. The Crown Prosecutor having opened the case, called Robert Sheehan, who deposed that he was a wheelwright, carrying on business in Murtoa. On the last day of October or lst November, had lost a number of tools – was using them up to 4 o’clock on Saturday afternoon-and identified the articles produced. The prisoner and Robert Bown who had pleaded guilty were at witness’ shop about three weeks before the Saturday, and were talking about some tools. Senior-constable Mullaney deposed to finding the tools at Bowns’ house when searching for the wheat. His Honor having summed up, the prisoner denied all knowledge of the offence, and the jury retired, shortly returning a verdict of “not guilty.” The Court then adjourned till the following morning. Robert Bown and Thomas Bowen were presented on the charge of larceny of a number of tools, the property of Mr. R. Lockhart. Robert Bown pleaded “guilty,” and Bowen “not guilty,” and the case proceeded against Bowen. The Crown Prosecutor having addressed the jury in opening the case called ‘Robert Lockhart, a farmer, residing near Murtoa, who deposed that the prisoner Bowen, was working for him about 12 months ago, last harvest for about a week. He slept in a shed where he (witness) kept some tools, he had since lost some tools and they were amongst the number in that shed. About last harvest prisoner and Robert Bown (who had pleaded guilty) called at witness place in the evening and had a chat, did not remain long, came together and went away together, missed the tools in the first week in November. Identified the tools produced as his. To prisoner — Remember you and Annie Bown calling one Sunday and asked if I had seen Robert Bown go by. I said ‘I had’. Did not know whether he had a bundle on his shoulder. Senior Constable Mullaney, deposed to finding the articles on the premises occupied by the prisoner. The prisoner addressed the jury denying having anything to do with the theft. His Honor briefly addressed the jury who retired and in a few-minutes returned a verdict of ‘not guilty’. The prisoner Thomas Bowen alias Thomas Fenton alias Thos. .Chiswell, with Robert Bown, several terms of imprisonment having been proved against them, were placed at the bar to receive sentence. Bowen produced a written statement which he said wonld apply to both of them and it was handed to His Honor. Bowen then said he had pleaded guilty to stealing the 25 bags of wheat to exonerate those who were not guilty. He had come to this part of the country about 15 months ago with the intention of endeavouring to obtain an honest living; but in an evil hour he was tempted to commit the crime. He pleaded for leniency, and declared his intention when his time expired to reform and earn an honest ivlihood. Robert Bown made no statement. farming community, if permitted to go unchecked, would cause a state of terror. They stole a man’s wheat when he could not know what they were doing, and acts of this kind could not be tolerated in a community; it would make all confidence between honest men impossible. working like himself, the tools of trade, and allowed no sense of shame, no sense of honesty to appeal to him. It was impossible to consider an appeal for leniency in such cases. Thomas Bowen had commenced his career 20 years ago, and followed it up by a series of crimes, for which he had received various terms of punishment, but it seemed it had had no effect upon him. prison life a dread to them. They did not know what solitary confinement was. It meant solitude, great mental strain; it meant bread and water; he would give it to both of them for the express purpose of making them dislike it, and to make them resolve that when they came out they would never go in again. Addressing Robert Bown His Honor said – For receiving the 9 bags of wheat, the sentence of the court is that you be imprisoned with hard labor at the Ararat gaol for the term of three years; the first fortnight and the first fortnight of every succeeding alternate month of the first year and the first fortnight, and the first fortnight of every succeeding alternate month of the last year, in solitary confinement. For stealing the saddle you will be imprisoned for six calendar months with hard labor, the first fortnight of the term in solitary confinement; this sentence to take effect on the expiration of the first sentence. For the third offence of stealing tools, you will be imprisoned for six months with hard labor, the first fortnight in solitary confinement; this sentence to take effect at the expiry, of the last two sentences. For the fourth offence of stealing farmer’s tools, you will be imprisoned for six months with hard labor, the first fortnight in solitary confinement; this sentence to take effect on the expiry of the three last sentences. That will last, therefore, for the term of four years and a half. Addressing Thomas Bowen His Honor said stealing 25 bags of wheat, to which he had pleaded guilty, was an offence of the gravest character, and must be stamped out in order to make honest industry possible. The sentence of the court was that he be imprisoned with hard labor in the Ararat gaol for four years, the first fortnight, and the first fortnight of every succeeding alternate month of the first year and the first fortnight of the first month, and the first fortnight of every succeeding alternate month in the last year to be passed in solitary confinement.